Should Railways Have A Pop-Up Service Capability? Most of us will be familiar with the concept of Pop-Up Retail. This is the first paragraph of the Wikipedia entry. Pop-up retail, also known as pop-up store (pop-up shop in the UK, Australia and Ireland) or flash retailing, is a trend of opening short-term sales spaces that started in Los Angeles and now pop up all over the United States, Canada, China,Japan, Mexico, France, Germany, the United Kingdom and Australia. The pop-up industry is now estimated to be a $50 billion industry. Pop-up retail has been an increasing factor during the retail apocalypse of the 2010s, including seasonal Halloween retailer Spirit Halloween, who has operated stores in vacant spaces during the season. Chris Stokes in his column in the December 2018 Edition of Modern Railways, gives a summary of and praises Adrian Shooter’s Vivarail project and its Class 230 train. Two of the units are scheduled for export to the United States, to demonstrate for the potential for ‘pop-up’ commuter services; the cost of a one-year period are said to be equivalent to the consultancy costs for opening a new route. Should such an approach be considered in this country too? The gestation period for new services on freight-only routes is probably the best part of 10 years, but it doesn’t have to be like that. So is Chris’s concept a viable proposition? Chris then goes on to give an example of a successful pop-up station. When floods swept away the road bridge at Workington in 2009; Network Rail and Northern constructed a pop-up station and introduced additional trains in less than two weeks. Recently, Liverpool Lime Street station was partly-closed for rebuilding, so Network Rail extended Platform 4 at Liverpool South Parkway station, so that it could be used as a terminus for trains from London and the South. The picture shows a Virgin Pendelino in the temporary platform. Passengers could then transfer to Merseyrail to complete their journey to Liverpool City Centre. 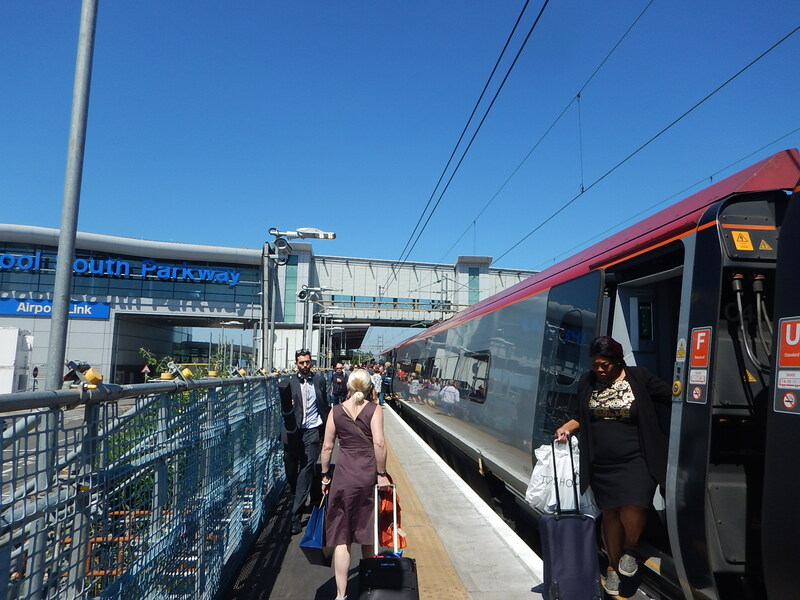 Incidentally, I’d like to know how many passengers to and from Liverpool, found it more convenient to catch their London train from Liverpool South Parkway station. Perhaps, after Merseyrail has its new trains, many passengers would like to use Liverpool South Parkway for longer journeys? Does anybody know of any other instances of pop-up stations like these in the UK? What Is Needed To Create These Pop-Up Stations? Various elements must be brought together to build a pop-up station. I can envisage three types of simple stations. A one-platform station on a single-track line. A two-platform station on a double-track line. A one-platform station on a double-track line. Type One, would be the simplest and would be worked bidirectionally. Type Two, would probably require a bridge across the tracks. Type Three, would need crossovers at both ends of the station, to allow the single platform to be worked bidirectionally. Obviously, Type 1 would be the most affordable and probably easiest to install. 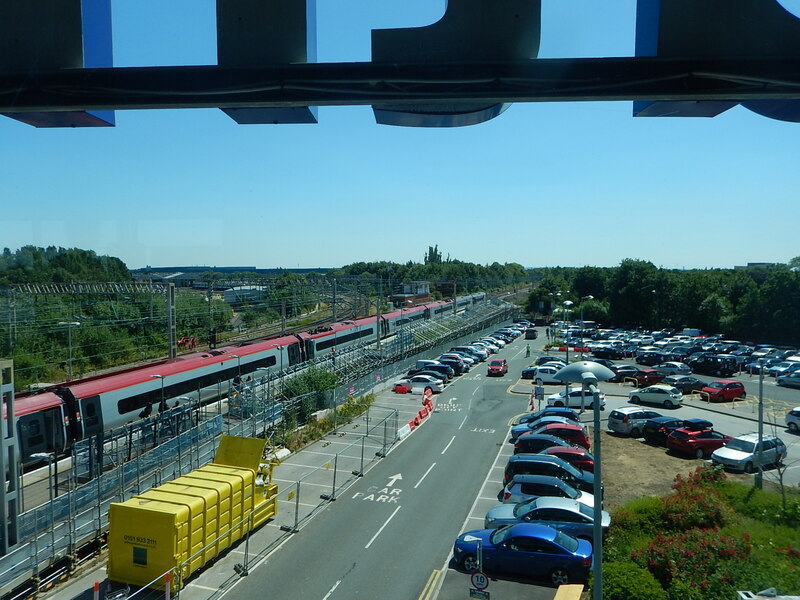 This picture shows the temporary extended platform at Liverpool South Parkway station. Only, if you look to the left, do you realise, it is not a permanent structure. The only problem was that at 150 metres in length, it was a long walk. But most pop-up stations would not be for eleven-coach Class 390 trains. Scaffolding and prefabricated platforms, should be able to cope with most situations. The platform extension at Liverpool South Parkway station didn’t need any buildings, as it was added to an existing station. But surely, Portakabin and their ilk can come up with something that would work for a couple of years, with perhaps a waiting room or shelter, a ticket machine and even toilets. A proportion of two-platform stations will need a bridge, so that passengers can get from one platform to the other. 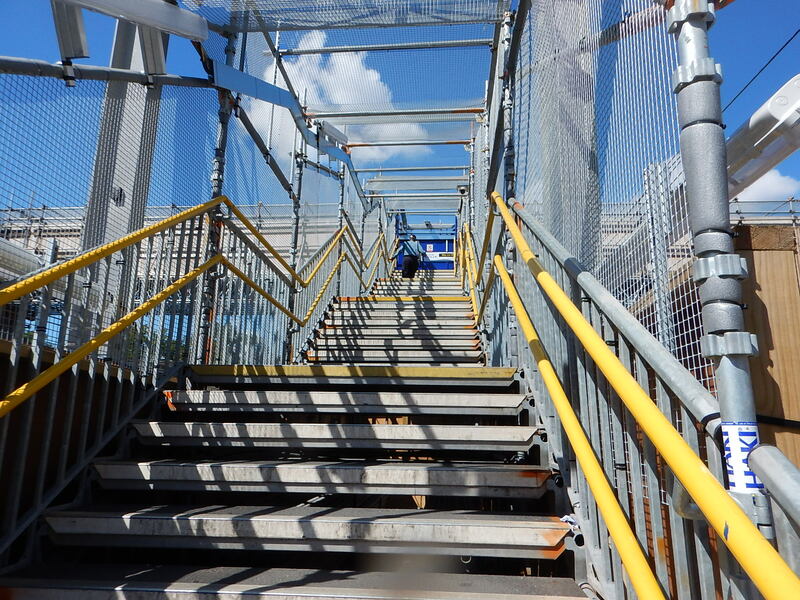 At the present time, where a temporary bridge is needed, Network Rail generally put up vast scaffolding structures, like this one at Forest Gate station, used during station reconstruction for Crossrail. What is needed is a well-designed temporary footbridge system, that can be lifted in place in sections from a train. Some footbridge versions might even have lifts and could be installed as pop-up bridges at stations, which urgently need step-free access. Perhaps, pop-up stations could use a version of Heatherwick Studio’s rolling bridge. I shall add some pictures of the open bridge, when they fix it. It would certainly bridge the gap between two platforms with a double-track railway in between. In a rail application, the bridge would be interlocked with the signalling and controlled by the signaller. Signals and lights could be added to the bridge to ensure complete safety. Wikipedia says the original at the Paddington Basin cost £500,000, which could probably be reduced if more were built. This page on the Merchant Square web site, shows the bridge in action. I suspect this bridge would work on single- or double-track lines, without electrification, or with third-rail or with overhead electrification. At many stations it could just be dropped in place from a rail-mounted crane, after preparing the existing platforms. I suspect though, that there would be a limit to the number of trains per hour it could handle. One of Heatherwick’s bridges, would certainly help in telling the locals, that they have a new station or step-free bridge across the railway. I wonder if Heatherwick Studio has been talking to Network Rail. The signalling might have to be modified to ensure safety. When all trains were fitted with in-cab digital signalling, as is planned, then this would surely make pop-up stations and services easier to install. The installation would surely be designed to minimise work on the tracks. Only the Type Three station would require more than minimal work to the tracks, but the station would only have one platform, which would not require a bridge. Chris Stokes talks about running new pop-up services on freight-only lines, but I believe that there will be calls to use pop-up stations to provide extra stops on existing services. As an example, suppose that Greater Anglia wanted to assess the demand for a new Soham station. In a year or two, the company will be operating at least an hourly service along the line with their new Class 755 trains. These trains are part of the new breed of modern trains, which will have the following. The ability to execute a fast stop at a station. Level access will be possible between train and platform. On-board CCTV systems to ensure safe loading and unloading of passengers. This will enable the trains to make a station stop without causing problems to the existing timetable. So if Network Rail, had the ability to quickly install a pop-up station, modern trains would allow a service to be tested at a reasonable cost. Suppose a station were to be installed at Soham or any other suitable place. I would expect Network Rail to produce standard designs for the foundations of their pop-up stations. Network Rail periodically close a line to replace track or do various other work. When a line is closed for this work and a pop-up station might be needed on the route, the standard foundations would be installed. Then, when the budget for the station had been obtained, the station would be installed and commissioned in a suitable possession. I believe a pop-up station is a feasible proposition. If a pop-up station is a feasible proposition, then it follows that to install perhaps five stations on a freight-only line to create a totally new passenger service is also a feasible proposition. The title of this post is the same as this article on Bloomberg. I had heard there was a protest about something last night and this explains what it was. I should declare an interest, in that I use black cabs about five or six times a month, when I am in a hurry or am coming home late at night from say a station. I have used Uber once, when my son paid for a cab from Walthamstow. The driver had come all the way from Ealing and got lost twice getting to my house. I am affected by London’s dirty air and feel strongly that as many vehicles in Central London should be zero emission. So I very much agree with the Mayor’s strategy of making all London’s new black cabs electric. But surely, this policy should also apply to Uber, mini-cabs and local delivery vehicles inside the Central area. It will in the future and it can’t happen soon enough. Black Cab Drivers Think Sadiq Khan Doesn’t Like Them! Black cab drivers never have a good word for Sadiq Khan, but then they didn’t Boris either. I didn’t live in London, when Ken was Mayor, so I can’t comment on that! But then I always say, that because we have a South London Mayor, we are getting a higher proportion of bus cuts. I don’t think, I’ve ever been driven by a South Asian black can driver, although, I’ve been driven by many Africans and Caribbeans. Go to Birmingham, and you’ll find lots of South Asian black cab drivers. On the other hand, I’ve been driven by several South Asian mini-cab drivers, from the firm round the corner. So is the Mayor playing to his constituency and ignoring the views of black cab drivers?